Making decorative yarn or string Easter eggs could become a new family tradition. This is a guide about making yarn Easter eggs. These eggs can be used as a centerpiece on your Easter table or you can cut a hole in them and they can be used as an Easter basket. These are easy enough to make that it can be a family project. If you are going to have your children help to make these eggs then I would suggest using quick drying glue instead of a glue gun when applying the decorations. It will just make it safer for the kids. What I love about these is that they are delicate and lacy but pretty sturdy when you go to store them. These can also be made from thrift store or yard sale finds on half empty spools of thread, just tie your ends together to make two toned eggs. These can be made all different sizes by varying how much you blow up the balloons. So have fun and make a dozen. You can display them on your table in a small bowl if you make small ones. One large one filled with Spring silk flowers makes a wonderful display. another small bowl, margarine container, or coffee can to use as stand for drying. Use some white paper or old sheet or table cloth to cover the work area, a old shower curtain would work well here also. I would try to avoid newspaper as the Stiffy or glue mixture can make newspaper ink bleed. Blow up balloons to desired size. I just put the starch in a bowl and dip the string in the starch and apply to the balloon. Wrap the balloon with crochet thread making sure that thread goes in all different directions as if wrapping a ball of yarn. How many times you wrap around the balloon is up to you; the less you wrap the lacier it will look, the more you wrap the sturdier the egg becomes. In addition to dipping the crochet thread as I put it on the balloon, I put it in small margarine container, the Stiffy Fabric Stiffener or your white glue and water mixture or full strength starch. With your paint brush, make sure that you saturated your crochet thread completely. This can be quite messy so I would cover your table with an old sheet or an old shower curtain. Stiffy Fabric Stiffener and the glue and water mixture or starch are water based so they will wash out. Set your covered balloon in a margarine container to dry. When it is almost completely dry, I flatten the bottom by pushing down on a flat surface so my egg will stand up right. Wrap wired ribbon around the egg and hot glue a bow to the side of the egg or top your choice. If leaving the egg whole for a centerpiece, fish out popped balloon with a crochet hook. If you are going to cut into the egg, take sharp scissors and cut a hole in the side of your egg. Take out your popped balloon. Now glue flat lace around the opening that you have made to cover all raw cut edges. Now you can decorate the opening with pearls or ribbon roses or rhinestones. You can fill the inside with Easter grass and use as an Easter Basket or you can fill the inside with small figures like a diorama or with silk flowers. 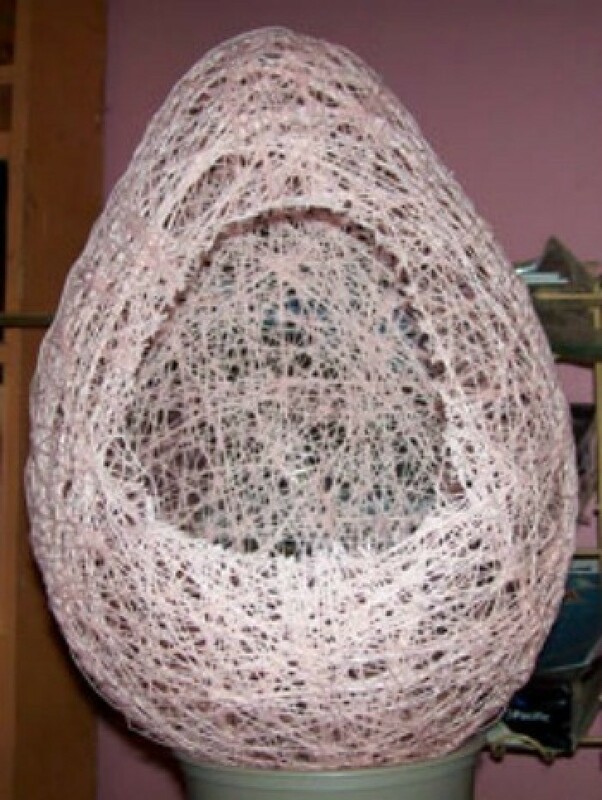 If you would like your egg to stand up rather than lay on it's side you can cover a small container with lace to set your egg into like a base for it. Or use a crystal bowl or silver bowl as the base. Why does no one have a picture of the string Easter eggs? How much string do I use? How much of the balloon should be covered? Does anyone have pictures for this craft? When I was in elementary school in the 1960's, we also made paper mache made with pretty colored paper or tissue paper over balloons. After it dried, we cut out the side and made a scene inside like a sugar egg. I purchase a bottle of liquid starch and a ball of crochet string. I fill a Ziploc baggie with the starch and place the ball of string in it and place both in a cereal bowl. I let it sit for 3-4 days and keep turning the ball of string in the bag until it is saturated all the way through to the core. I blow up a balloon to the size I want. Now comes the messy part, place newspaper on the table and the floor, this is going to get real sticky! I wrap the balloon with the whole ball of string, squeezing some of the liquid down the string as I go. I take the ball of string out of the bag and place it in the bowl, stand on a chair and wrap the balloon until the whole ball is wrapped around the balloon. I then place newspaper down where I'm going to set the eggs to dry, this will take 3-4 days. I then place the balloon lightly in the top of a drinking glass (fat side of the balloon in the glass first), so it retains it's shape and as it dries I turn it around and upside down. After 3-4 days I remove it from the glass. You will find that the balloon inside will shrink, just pop it slowly and remove it. You can then draw the shape you wish to cut out on the egg with a marker and cut it out. Hope this helps! I just love to make these! Enjoy. 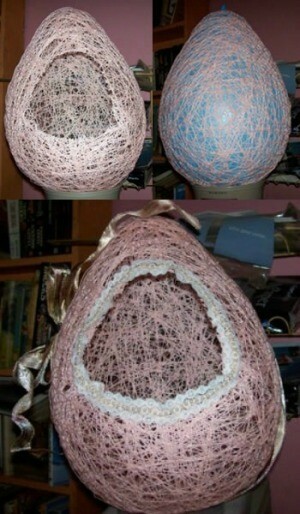 There are directions for this craft under Lacy Easter Eggs on Thrifty fun. The article has pictures also. I made these many years ago with sugar water. I wouldn't recommend it. The first year it went great - the next brought 100 bazillion ants. I was looking on here to see if anyone uses starch and I see they do. I will do that. But yes, get yellow, pink, or whatever color crochet thread from a craft store and blow up a balloon to whatever size you want it and start wrapping, criss crossing the thread in every direction (it will look like one of those old string designs people used to make) until you use all the ball, or until you get tired and decide that's the perfect amount. Dip it all in starch - not sugar water (LOL) - and sit it in the bathtub to dry over a pan or whatever. Then when it's dry pop the balloon with a pin and pull it out. Figure out how you want to set the thing on a table as a candy dish and squish the bottom down flat so it sits. Cut out an oval on front. Put glue around the edges you've just cut, and glue on lace and bows if you want. Put Easter grass inside and fill with candy. It's really kind of fun to do with or for kids and looks very pretty. I made these too years ago when they used sugar water to make them stiff...until...... lol the mice enjoyed them more than I did. Thank goodness they came up with the fabric stiffener or the glue mixture. We made cute smaller ones for Christmas decorations to hang on the tree also. Pour some liquid starch in a med. to large bowl. I used 6 different colors of pastel shades for spring of thin ribbon. I cut the ribbon pieces about 6 inches long - 2 to 3 cuts of each color and put them in the starch filled bowl. If the ribbon wasn't covered with the starch I added just enough to cover them. While the ribbon soaked in the starch I blew up 8 small water balloons to the size of med. to large eggs. Then take one ribbon at a time out of starch and gently run your forefinger and thumb down the ribbon with little pressure to remove excess starch and wrap around balloon in no particular fashion. Then take another color and repeat until you like the design and colors. You can use many ribbons or just a few around each balloon. If a piece of cut ribbon seems to long at the time of use just trim with scissors to end it wrapping. To hurry the drying you can use a hair blow dryer on cool setting but its best to wait til the ribbon doesn't feel damp. Then take a straight pin and pick a spot where the balloon is exposed between the ribbons and pop the balloon. Wha-La! Ribbon Eggs!! I also took a Dollar Store bought large doily and soaked it til it was saturated with starch and place it in a large bowl til dry. The ribbon eggs looked lovely in it!! Could you please send me how to make Easter eggs out of string and balloons? 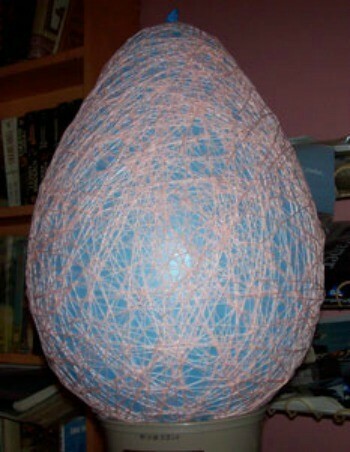 I am looking for instructions on how to make string Easter eggs. You use embroidery floss, starch, and a small balloon. Can anyone help me with instructions? To make String Easter Eggs, you will need liquid starch, CROCHET thread, a balloon and a pan to catch the starch. Blow up the balloon to the desired size and tie the top two times. Take the end of the crochet thread and tie it to the top of the balloon. Start winding the crochet thread around the balloon in all directions until you have used up all the thread. Tie the end to the top of the balloon. Pour the liquid starch on the balloon, making sure you have your pan underneath to catch the dripping starch. Saturate the balloon and use your hands to make sure all the thread is covered in starch. Hang to dry for about a day, making sure you have a pan underneath the hanging egg to catch the starch. As the starch hardens, the balloon will shrink some, but it should not pop.The bottom will be the last to dry. When the starch is completely dry, pop the balloon. Gently, press the bottom on a flat surface so the egg will set straight. With scissors, cut a hole in the side of the egg in an oval shape. Decorate with lace, flowers, etc., using hot glue. Put some Easter grass in the bottom and glue curly ribbon to the top. Enjoy! Happy Easter! When I make them I just put the starch in a bowl and dip the string in the starch and apply to the balloon. 1. If you draw a circle on the balloon close to the bottom with marker. When you apply the string don't put any in the circle area. When you are done and the balloon is dry, you now have an opening for a small toy or egg. My mom used to make these years ago. She would use sugar, not starch. Cook the sugar/water mix (maybe look up the ratios on a cooking site) to a soft crack stage. Let cool until just warm, and dip the string covered balloons. 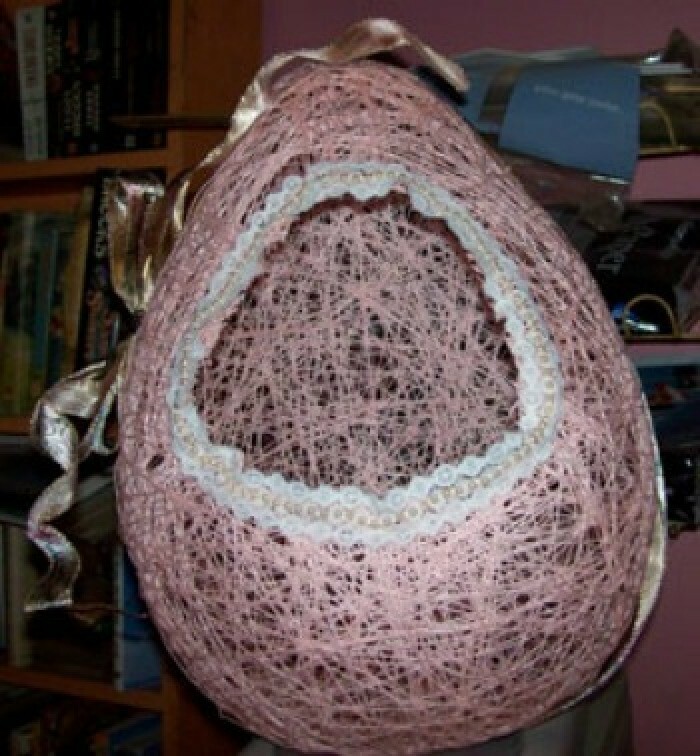 She used crochet thread for pretty colors.We always cut the opening after the eggs were dry. We would hang them over a cookie sheet by the balloon tie end to drip. It makes a nice crystalline look. One problem, though. I can remember my little sister licking them. Happy Easter! There are instructions for this craft at this link. Hi, first you wrap your balloon with string usually one ball of string per balloon. You go up and down on the balloon then wrap around sideways, then finish going up and down again that away string is in all directions and sticks well after being dipped. You want to wrap about 5 at a time depending on how many you wanna make. Then you want to get a big pan and mix your sugar. I use 1 cup sugar to 2 cups of water. Heat your sugar on stove on medium heat till warm and all sugar is dissolved ,sugar should be a thick syrupy texture, let cool then pour in sink or something big enough to roll your balloon around in. Make sure you soak your string wrapped balloon , be careful as sugar starts to crystallize and may pop balloon.